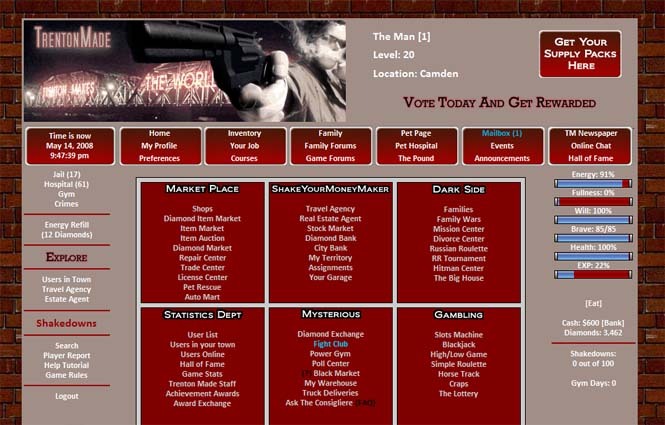 Play the best mafia game on the internet. Control your gang in the fastest paced mob game online! 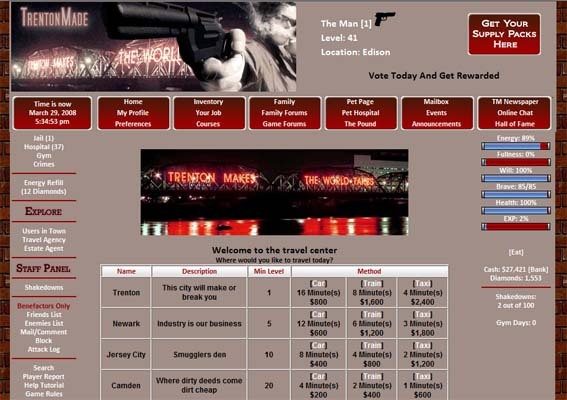 Create a new account to play Trenton Made. Read the tutorial for more info. Rise above the trappings of ordinary life and enter the notorious mafia game. Put contracts out on your enemies or kill em yourself, play the best mob game on the internet. Buy and sell black market goods, be boss of a family and rule with absolute power as you enjoy the best mob game out. Take part in multi-step Mob Games and Missions. Bribe cops, burn down buildings, spy on your rivals, and outsmart the feds. Shakedown your territory, wage war, smack talk in the forums... we can keep you entertained for life, play the best mob game on the internet. Come join our Global community and become Trenton Made. Contact Us | Hot Games | Game Copyright © 2010 T&Z Gaming.